Professor Adrian Stanciu holds a Master of Science in Mechanical Engineering from University Politechnica Bucharest, Rumania. He also holds an Executive Management Degree in Management and Leadership Strategy, Finance and Banking, People Management and Performance Measuring, and Operations Management at INSEAD, Executive Management Program. 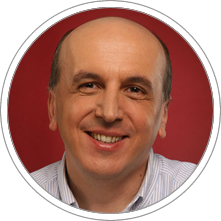 Professor Adrian Stanciu has been the Indirect Sales Director and General Manager for Central and Eastern Europe at Xerox Romania. In addition, he has developed and delivered numerous Executive Training programs to customers of various sizes and of various industries, such as IBM, Xerox, Orange, Raiffesen Bank, Citibank, and Allianz. Professor Stanciu currently is the Associate Dean of Knowledge and Leadership at Maastricht School of Management (MSM) Rumania and Associate Professor at CENTRUM Católica Graduate Business School.